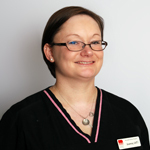 I graduated from Mercy College in 1999 with a Bachelor's of Science degree in Veterinary Technology. I became a Licensed Veterinary Technician shortly after graduation. 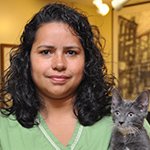 In 2000, I began working at Norwalk Animal Hospital as a technician. 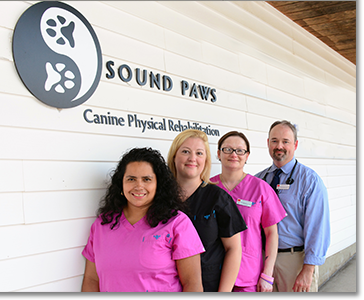 In 2012 I completed my certification through the Canine Rehabilitation Institute and joined my husband at Sound Paws. I developed an interest in physical therapy after experiencing its benefits first hand, with my young child. I have seen how much rehab can also help animals and am very proud to be part of the profession. I have lived in Norwalk, CT since 1990. Of all the jobs I have held, working in the veterinary field has been the most rewarding. I have been working in the veterinary field for over seven years. In those years it has been a great learning experience. When not working I enjoy spending time with my family, petsitting, and dog walks.